Figure 2.8 Edge-on view of the gas and dust around the proto-Sun after the dust has settled towards the mid plane. The thickness of the dust sheet has been greatly exaggerated. The concentration of the dust into a sheet leads to a greatly increased chance of a collision between two grains. Neighbouring grains tend to be in similar orbits and therefore a significant fraction of the collisions is at sufficiently low relative speed for the grains to stick together in a process called coagulation. Coagulation is more likely when one or both grains have a fluffy structure, and it is aided when the two grains have opposite electric charges, or when they contain magnetised particles. Gravitational instabilities in the dust sheet might also aid coagulation. The outcome of coagulation is the gradual build-up of bodies of order 10 mm across. The time required for this to happen depends on the relative speeds of grains in slightly different orbits: the lower the relative speeds, the lower the collision rate and the slower the coagulation. These relative speeds are lower, the smaller the orbital speeds. Therefore, the coagulation time generally increases with increasing heliocentric distance. This tendency is reinforced because the coagulation time also depends on the average spacing of the grains: the greater the spacing, the slower the coagulation. This spacing increases as the column mass of the disc decreases, and so the coagulation time is further increased with increasing heliocentric distance. 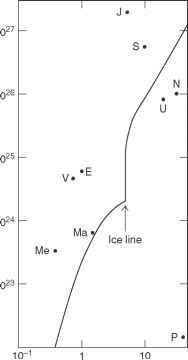 An exception is at the ice line, where the step up in column mass causes a significant reduction in the coagulation time in the Jupiter region. Broadly speaking, the coagulation times are in the approximate range of 1000 years to a few tens of thousands of years within about 4-5 AU of the proto-Sun, increasing to many hundreds of thousands of years at 30 AU. The earlier times for dust condensation and settling are shorter. By the time bodies 10 mm or so in size are appearing at 30 AU, the bodies out to 4-5 AU have grown to 0.1-10 km across. These are called planetesimals, 'little planets', rocky within the ice line, and when they subsequently form, icy-rocky beyond it. There are at least two means of producing planetesimals, both of which might have been significant. The first is a continuation of coagulation, promoted by the continuing thinning of the dust sheet with the corresponding increase in its density. The second is a different consequence of this density increase. At a sheet thickness of order 100 km it is possible that the gravitational attraction between the bodies constituting the sheet leads to gravitational instability, the sheet breaking up into numerous fragments, each fragment forming a planetesimal. Though the formation of planetesimals is a considerable step towards bodies of planetary size, there is clearly some way still to go. The theory of the remaining stages of planetary formation indicates that the process was rather different in the inner Solar System - within the ice line -than in the outer Solar System. (a) Use Figure 2.7 to estimate the total mass in the planetesimals between 0.8 AU and 1.2 AU from the proto-Sun. Compare your result with the mass of the Earth, and comment on the significance of the comparison. (b) If the mean density of a planetesimal around 1AU from the proto-Sun is 2500 kg m-3, calculate the number of planetesimals corresponding to the mass you calculated in part (a). In both parts, state any assumptions that you make. A planetesimal about 10 km across has sufficient mass for it to exert a significant gravitational attraction on neighbouring planetesimals. This increases the collision rate between planetesimals, and models show that the net effect is growth of the larger planetesimals at the expense of the smaller ones. An essential condition for net growth is that the collisions are at low speed, thus requiring neighbouring planetesimals to be in low-eccentricity, low-inclination orbits. Such orbits could have been wrought by nebular gas drag on planetesimals in more eccentric, more inclined orbits. The acquisition by a larger body of smaller bodies is called accretion. As a planetesimal gets more massive its accretional power increases, and consequently there is a strong tendency for a dominant planetesimal to emerge that ultimately accretes most of the mass in its neighbourhood. (This is an example of the Matthew effect: 'For unto every one that hath shall be given, and he shall have abundance: but from him that hath not, shall be taken away even that which he hath.' The gospel according to St Matthew XXV, 29. The Matthew effect is also familiar to players of Monopoly.) The outcome is runaway growth, in which the population of planetesimals in a neighbourhood evolves to yield a single massive planetesimal called an embryo, that accounts for over 90% of the original planetesimal mass in the neighbourhood, plus a swarm of far less massive planetesimals, the largest being perhaps a million times less massive than the embryo. The neighbourhood of an embryo is an annular strip covering a small range of heliocentric distances, and so we get a set of embryos each at a different heliocentric distance. Figure 2.9 Embryo mass versus heliocentric distance as calculated in one model. The masses of the planets are also shown, in their present positions. within the ice line are spaced by about 0.02 AU, and the time taken for the full development of a single embryo from a swarm of planetesimals is of order 0.5 Ma at 1 AU, and increases with heliocentric distance. These times are very uncertain, though a general increase in time with increasing heliocentric distance emerges in all models, largely because of the decrease in column mass. Another common feature is an increase in embryo spacing with increasing solar distance. □ In this model, how many embryos are there between 0.3 AU and 5 AU? There are about (5 - 0.3)/0.02 embryos in this region, i.e. 200 or so. This is the region presently occupied by the terrestrial planets and the asteroids. From Figure 2.9 and the 0.02 AU spacing, their total mass can be estimated to be of order 10 times the mass of the Earth. Figure 2.9 shows that (except perhaps for Mars) we have to put embryos together to form the terrestrial planets. However, assembly is a slow process because of the small number of embryos and their consequent large spacings. We have to rely on modest orbital eccentricities to produce collisions. Such collisions would produce fragmentation, but the gravitational field would be sufficient to assemble most of the fragments into a body with nearly the combined mass of the two colliding embryos. At some intermediate stage there could have been a few dozen Mars-sized embryos, and a host of less massive bodies. Collisions would usually have been off centre, and so even if many of the embryos initially had small inclinations of their rotation axes, larger inclinations could readily be imparted to some planets through the arrival of large embryos. This is in accord with item 6 in Table 2.1. The time occupied by the transition from embryos to a terrestrial planet increases with increasing heliocentric distance. It is estimated that for the Earth the time was of order 100 Ma. This is by far the slowest stage in the formation of the terrestrial planets, though it is short compared with the 4500 Ma or so that have elapsed since. Figure 2.10 is a time line summary of the formation of a terrestrial planet. The relative durations of each stage are more reliable than the absolute durations, which vary considerably from model to model. Note the logarithmic scale. After the last embryo collision we are left with planetesimals bombarding an essentially complete planet. There is widespread evidence that the terrestrial planets and the Moon suffered such a heavy bombardment, and that it tailed off about 3900 Ma ago, to be followed by a light bombardment by small bodies that persists to the present day. If the terrestrial planets did indeed form as proposed here, then they should consist largely of substances more refractory than the hydrated minerals in Table 2.3, and the closer to the Sun the more refractory the composition should be. Note, however, that the compositional differences between the planets will have been moderated by embryos and planetesimals arriving from different regions. This is in accord with what we know about terrestrial planet composition. Figure 2.10 Time line of the formation of a terrestrial planet. The relative durations of each stage are more reliable than the absolute durations, which vary considerably from model to model. Nebular gas would also have been captured, and though only to the extent of a tiny fraction of the planetary mass, it would have provided the planets with atmospheres rich in hydrogen and helium. In the theory, such atmospheres are removed by the T Tauri activity of the proto-Sun. Throughout the T Tauri phase the nebular gas has been depleted by its accretion onto the proto-Sun. The T Tauri activity also removes nebular gas to space, driven out by copious UV and particle emission. This is the mechanism by which the last remnants of gas are swept away, and it happens rather rapidly. In Figure 2.10 this terminal sweeping is denoted by 'nebula rapidly disappearing', which is also around the end of the T Tauri phase. Figure 2.11 High relative speeds when two bodies in substantially different orbits collide. survivors today as the asteroids, with perhaps only the order of 0.1% of the original mass in this region. The growth of Mars at around 1.5 AU must also have been stunted by the stirring of the planetesimal and embryo orbits by Jupiter. 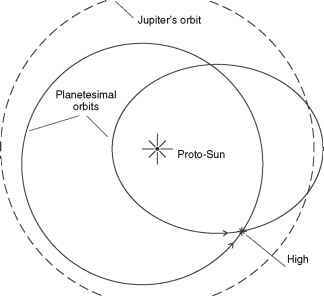 Nearer the Sun, the effect of Jupiter might have been to speed up the final stages of growth of Mercury, Venus, and the Earth, partly through the provision of material from outside the terrestrial zone, and partly by increasing the eccentricity of the embryo orbits, thus increasing their collision rate without producing the huge relative speeds of the asteroid region. Of the terrestrial planets only the Earth and Mars have satellites. The two tiny satellites of Mars (Table 1.2), Phobos and Deimos, are probably captured asteroids. Their densities are too small for them to be pieces of Mars, but the class C asteroids (Section 3.1.6) meet the requirements. Capture directly into orbits so near Mars is unlikely. Instead, a class C asteroid could have struck Mars, and the disc around Mars thus formed, consisting of a mixture of the asteroid material and the Martian crust, underwent accretion to form Phobos and Deimos. The Moon, at 1.2% of the mass of the Earth, is far too massive for capture to be likely. In recent years widespread support has grown for the view that the Moon is the result of an embryo with a mass 10-15% that of the Earth, colliding with the nearly formed Earth at a grazing angle. 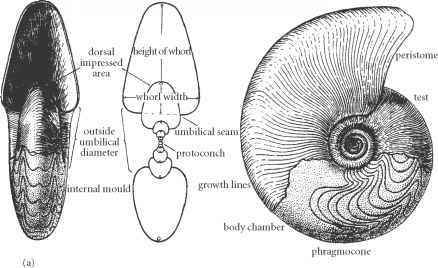 All but the core of the embryo, and some of the outer part of the Earth, is scattered along an arc, predominantly as a gas produced by vaporization during the impact. Much of this material returns to Earth, some escapes, but a small fraction goes into orbit around the Earth, from where, in only a year or so, it forms the Moon. You will see in later chapters that the detailed composition and structure of the Earth and the Moon provide a good deal of support for this theory. One simulation of the process is illustrated in Figure 2.12. The lunar orbit has a (nearly) fixed inclination of 5.16° with respect to the ecliptic plane (Figure 1.25), rather than to the equatorial plane of the Earth. This strong link to the ecliptic plane makes the Moon different from all the other large planetary satellites in the Solar System. Yet the models show that initially the inclination was (nearly) fixed with respect to the Earth's equatorial plane. This changed, because tidal forces between the Earth and the Moon caused the Moon to recede. As it did so, the Sun became more influential on the Moon, and the Earth less so, with the likely result that the lunar orbit acquired a (nearly) constant inclination with respect to the ecliptic plane. List the features of the Solar System in Table 2.1 that apply to the terrestrial planets. For each feature in your list state whether it can be explained by solar nebular theories.